Sometimes scorned and often overlooked, puppetry plays an important role in the history of theatre. Classified as a form of performance that involves the manipulation of puppets, puppetry is believed to have originated 3000 years B.C. and has been a theatre trend all over the world. Some believe the art of puppetry evolved from the use of inanimate objects in ancient ceremonial rituals and celebrations, and over time turned into a form of entertainment used in almost all human societies. It is said that in Japan, large, expressive bunraku puppets were created when playwrights became tired of the demands of actors. In Europe, puppets were widely used for so-called morality plays, illustrating to the – largely illiterate – population how to properly conduct themselves. Puppets were used to replace actors, as it would have been unacceptable for real people to portray these indecent and immoral acts. 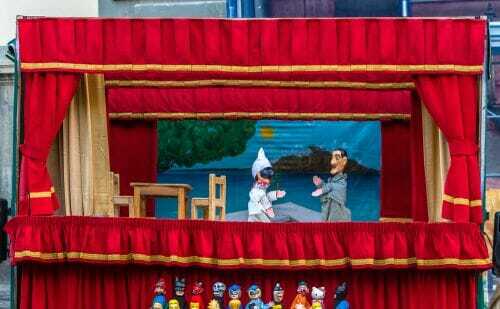 A great example of this is the now famous Punch and Judy plays, which originated in 16th century Italy! Although people now often associate puppetry with children’s theatre, the use of puppets extends into all kinds of modern-day productions, often in subtle ways. Perhaps one of Australia’s most well-known puppetry acts is that by local production company Snuff Puppets. The group has its own take on contemporary puppetry, often employing clever stage lighting and music to complement their unusual creations. People still love to watch puppets in action, but there is now more technology available to help puppeteers bring them to life, and Snuff Puppets makes clever use of this. Gadgets such as motors and remote controllers allow for many new possibilities, and we’ve seen a revival of puppetry over the last few years. As many in the theatre industry will tell you, puppetry is a true art form – with or without technological wizardry. After all, to bring an inanimate object to life is not just child’s play!